There is an age-old wives tale that says that if you plan to grow squash and cucumbers in the same garden, you should plant them as far away from each other as possible. The reason being is that if you plant these two kinds of vines near each other, they will cross pollinate, which will result in alien like fruit that will not look like anything edible. There are so many untruths in this old wives tale, that it is hard to know where to start disproving them. Let’s start with the whole basis of this idea that squash plants and cucumber plants can cross pollinate. This is absolutely, without a doubt, undeniably not true. Squash and cucumbers can’t cross pollinate. 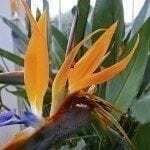 This is because the genetic structure of the two plants is so different; there is no chance, short of laboratory intervention, that they can interbreed. Yes, the plants may look somewhat similar, but they are not all that similar really. Think of it like trying to breed a dog and a cat. They both have four legs, a tail and they both are house pets, but try as you might, you just won’t get a cat-dog. Now, while a squash and a cucumber cannot cross pollinate, a squash and a squash can. A butternut could very well cross pollinate with a zucchini or a hubbard squash could cross pollinate with an acorn squash. This is more along the lines of a Labrador and a Golden Retriever cross breeding. Very possible because while the plant’s fruit may look different, they come from the same species. Which brings us to the next fallacy of the wives tale. This is that the cross breeding will affect the fruit that grows in the current year. This is not true. If two plants cross pollinate, you won’t know it unless you try to grow the seeds from the affected plant. What this means that unless you intend to save the seeds from your squash plants, you won’t know whether your squash plants have cross pollinated. Cross pollination has no effect on the taste or shape of the plant’s own fruit. If you are into saving seeds from your vegetable plants, you may see the effects of cross pollination the next year. 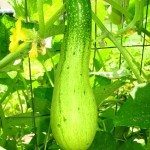 If you plant the seeds from a squash that was cross pollinated, you could end up with a green pumpkin or a white zucchini or literally a million other combinations, depending on which squash cross pollinated with which. For a home gardener, this is probably not a bad thing. This accidental surprise can be a fun addition to the garden. But, if you are concerned with cross pollination between your squash because you intend to harvest the seeds, then you probably plant them far apart from each other. But, rest assured, your cucumbers and squash are perfectly safe if you leave them unescorted in your vegetable beds.